Yesterday morning, I found ewe 1526 with a brand-new ewe lamb (born overnight) – she put a wrap on our 2016 lambing season (an interesting side note – she was also the last ewe to give birth last year). In many ways, lambing season is one of the measuring sticks we use to evaluate the success of our management over the previous 12 months. The year’s lambing season is dependent on ewe nutrition prior to and during our breeding season (the previous September through mid-November), our management in the 3 weeks post-breeding, and weather and management during the 6 week lambing season. By any measure, this year’s lambing season was our most successful ever – and the result of continuous learning and management adjustments on our part. I should note that I offer this report not as a comparison with other sheep producers; rather, I want to document our efforts this year as a benchmark for evaluating future management decisions. Improved nutrition at flushing and breeding: In 2015, we were able to graze the entire ewe flock on irrigated pasture from early September through early December. We also utilized a high protein, high energy supplemental feed (pea crisps) through flushing and the first 17 days of breeding. 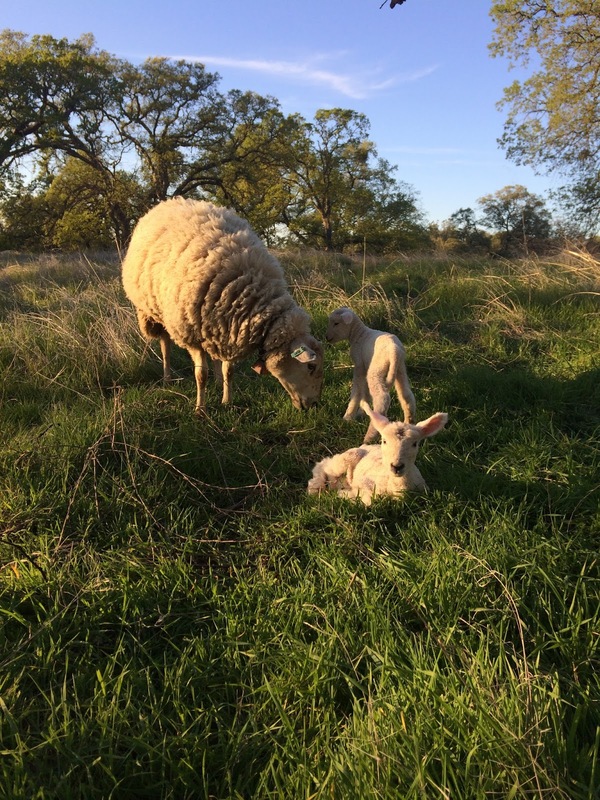 I believe that our flushing and breeding nutrition greatly improved our conception and lambing rates, as well as our synchronization (that is, the percentage of ewes lambing in the first 34 days of lambing season). We had 3 sets of triplets and our first ever set of quadruplets this year! Improved management and nutrition during settling: For several years, we’ve “settled” the ewes after removing the rams in the fall. During the 18-21 days after pulling the rams, we do not do any significant management (other than moving the ewes on to new pastures as normal). This year, we were also able to keep the ewes on irrigated pasture during this phase. I think this probably helped a small number of ewes maintain their pregnancies during this critical phase. 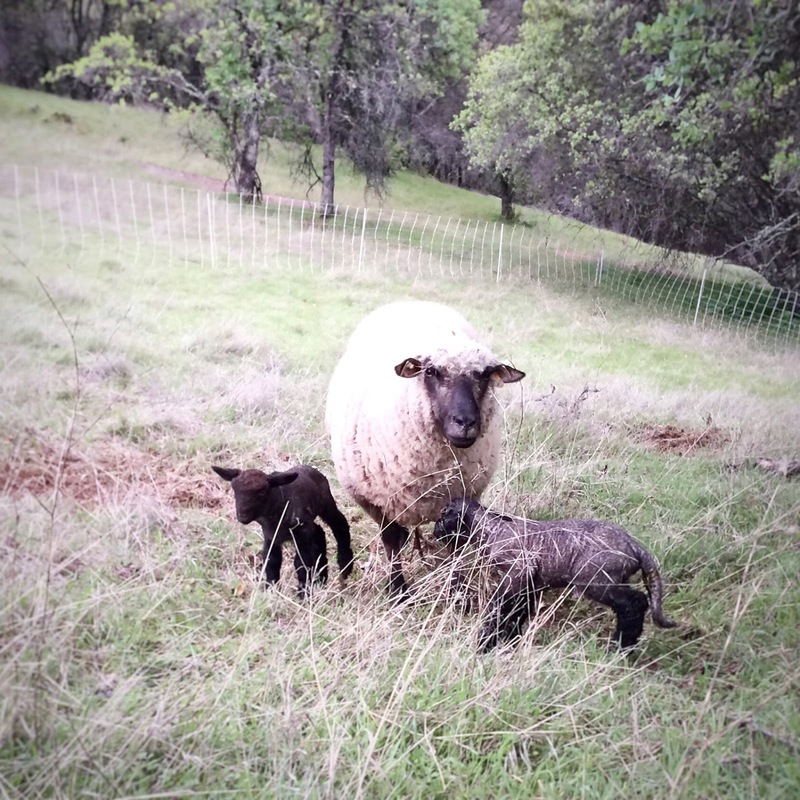 Selection for multiple births: One of the criteria we’ve used to determine which ewes we would keep during our drought-induced de-stocking over the last two years was a ewe’s propensity to twin. We also only retained ewe lambs that were born as twins. This likely resulted in more multiple births this year. The differences between our breeding groups (Shropshire, White Face and Mule) seem to back this up: we have bred White Face replacements in each of the last two years, which means we haven’t been replacing our Mule ewes with ewe lambs. This year’s replacement ewe lambs will all be Mules, which should pay dividends when they have their first lambs in 2 years. Lost 1 lamb to watery mouth (E. coli infection) – first time this has ever happened (it’s unusual in a pasture lambing system). The lamb was one of set of triplets. We processed the lambs within 24 hours (as we normally do), but this lamb never really got up and going. Lost a sibling to this first lamb several weeks later during a rainstorm. The ewe had unusual teat placement, and we’d been worried about her remaining lambs since losing the first one. We will carefully evaluate the ewe at weaning to determine whether she should be culled. One lamb was born weak to a mother that focused on the other twin. She’s an older ewe, and we’ve marked her to be culled. Took the lamb home, but she never really got going. Lost one lamb from a set of triplets during a rainstorm. Probably weather related. Lost one of a set of twins born to a maiden ewe early in lambing season. Not sure about the reason. The ewe will get one more chance. Lost a weak lamb born as the smaller of a set of twins. This was a late-bred ewe (and the lambs were sired by different rams). Took the lamb home; it rallied but didn’t make it. It was not the ewe’s fault. Since we’ve been able to make improvements to our irrigation system, we’ll have higher quality forage through the summer and fall this year. As a result, we’ll be able to keep the lambs on the ewes through the third week of June. Following weaning, we’ll keep the replacement ewe lambs and feeder lambs on irrigated pasture (we anticipate keeping about 30 total). The ewes will move back to dry forage through the end of August (when we’ll start flushing them). At least visually, our wool yield looks to be improved over previous years (which is likely related to nutrition). Wool quality is somewhat diminished as one of our breeding groups picked up cockleburs during the breeding season. We’ll market all of our wool on a commodity basis this year. Last year, we used a free source of flushing feed – waste pea crisps. These were about 22% protein and 30% fat. This feed source won’t be available this year, so we will begin researching alternatives that have a similar nutritional profile. Canola meal looks promising, but we will need to evaluate the economics. Halfway through - lambs born on March 3, 2016. We hope to market a number of our feeder lambs to other local producers this summer. We’ll also keep 10-15 to finish on grass. The remainder of our feeder lambs will be marketed prior to end of Ramadan. Over the last several years (as we’ve sold productive ewes to other producers), we’ve realized that we’ve done a good job of building the maternal ability of our ewes and ewe lambs. Consequently, we’ll market a few replacement ewe lambs (both Mules and Shropshires) to other producers. Finally, we’ll market the best of our Shropshire ram lambs as rams. We’ll try to manage our irrigated pastures with an eye towards growing lambs and saving forage for flushing/breeding. The replacement ewe lambs we retain will all be from multiple births. We’ll also keep one Shropshire ram lamb (also from a multiple birth). This should provide some genetic predisposition toward twinning in the future. We anticipate keeping enough replacement ewe lambs to maintain our total flock size at 65-70 females. Finally, we’ve been able to make just a single pass over most of our winter grazing land. This has allowed for significant regrowth post-grazing. While this will allow us to stockpile forage for summer grazing for the ewes, as well as for post-breeding grazing next winter, we will need to balance our forage needs with landowner priorities for fuel reduction. Anecdotally, we’ve noticed more native perennials on some of our winter rangelands – I hope to formally measure changes in these perennials over the next several years. The last lamb of the year! Totally fascinating! Need to know: What is a maiden ewe? How does a mule sheep differ from the others? Probably have lots more questions, but you have to be a very busy man keeping all those records and shepherding, so I won't bother you more. Thanks for sharing this good info and teaching a layman the ropes! Keep asking questions - that's the reason I'm doing this project! A maiden ewe is a first-time lamber (we'd call her a heifer if she was a bovine). A mule is a cross-bred - sired by a blueface leicester ram (an English breed) and out of a north country or border cheviot ewe. In the UK, this cross is called a mule.